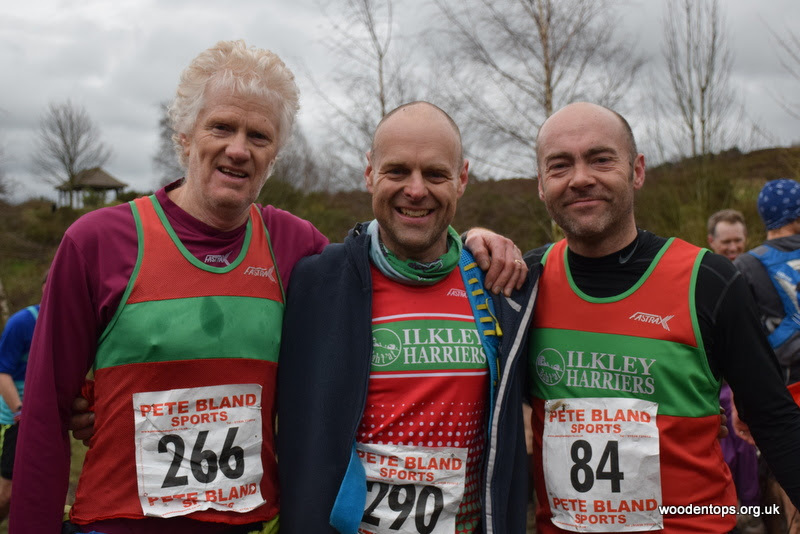 From Alison Weston ... Ilkley Harriers hosted its annual Ilkley Moor Fell Race on Sunday in extremely muddy conditions. Tom Adams was the clear winner in 37:16 followed by Ted Mason from Wharfedale in 41:06 and Graham Pearce from Pudsey and Bramley in 41:20. The Harriers had a great turn out of runners and race marshalls. Euan Brennan had a great race to come 5th and 1st under 18, Jack Cummings was 9th postion and 1st under 21, and Ben Shepperd was in the top 20. Pauline Munro was 1st Fv40, Alison Weston 1st FV50, Malcome Pickering 1st MV60 and Norman Bush 1st MV70. From Paul Sugden... Windy and hilly conditions finished in 2:11:38 No doubt there were other harriers running the half or the 10K for which Jack Wood ran in 40:00 but position not known as results have only been issued in alphabetic order at the moment. From Donna Jackson ... my time for today's Harewood 10k was 56:01 Great race, well organised, shame I couldn't do the Half Marathon distance as planned but due to injury I opted for the shorter route... I enjoyed it all the same! From Val Kerr ... Mud, mud, glorious mud ! 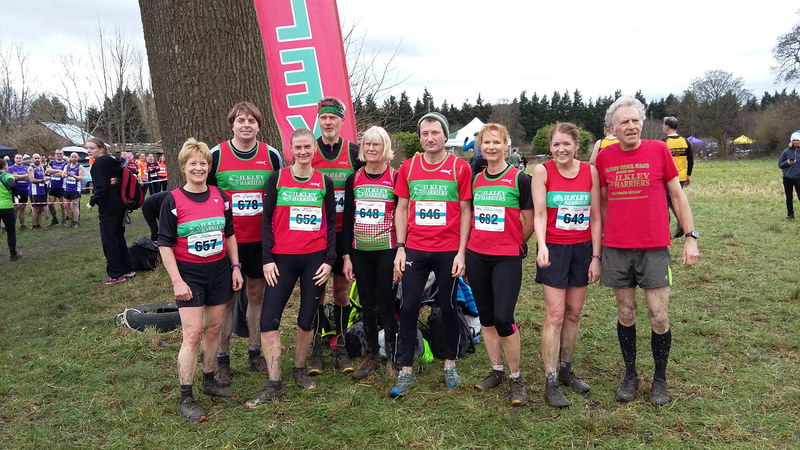 - A few hardy Harriers turned out for the 4th of the Peco X country races on what should have been a nice, 4.9 mile, undulating course around Pendas Fields and woods. However rain during the week had turned large parts of the tracks to thick gloopy mud, especially for the ladies race as the course had been nicely churned up by the feet of nearly 400 men by then. It was difficult for large parts of the course to stay upright and at times it felt as if you were running with lead weights on your feet with all the mud stuck to them. At the start of their race the men were apparently told to "look out for the bog". Quite which bog the marshalls were talking about nobody knows! Some good results, especially from Ellie Kitchen who finished in 14th position in the ladies race. Thanks to Rob Budding for standing by with the club banner and spare numbers and ably filling Gaynor and Steves shoes. From Jim Ryder.. 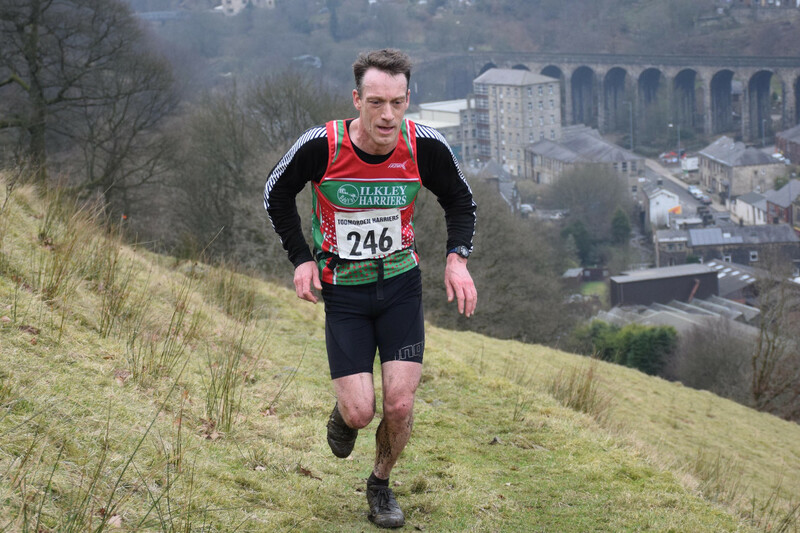 I ran the Flower Scar Fell Race this Saturday, 8.3 miles with 2200feet from Todmorden Cricket Club. The race winners were Andrew Worster (Todmorden) 1h07 and Annabelle Mason (Leeds University and Fell Club) 1h28. I managed 27th out of 176 in 1h19 for the first V50 prize. A new route for this year. It has everything in it from steep long climbs, short drops, moorland tussocks, muddy plantation paths, contours steep above the Todmorden valley. It reminded me of the Noon Stone Fell Race near Mytholmroyd, discontinued in 2011. Well organised, friendly and recommended. From Sue Williamson ... Lucy Williamson competed in this classic short fell race, 8K 390m of ascent. Out of a field of 136 competitiors with a result of 49.31 minutes Lucy took 45th position. From Petra Bijsterveld ... Sally Malir and I were the only two Harriers on the Dewsbury 10K start line this morning. Cold but still weather provided excellent running conditions on this out and back course with just 115 feet of elevation to deal with in the first half, which makes the return leg a gentle downhill. Devoid of any interesting scenery to distract the mind from the task at hand, and with plenty of encouragement from the marshals and supporters, this race has PB potential in spades and it was my 4th year in a row here. Having had a disappointing race last year I was hoping for a better time and thankfully the legs were with the programme today. I felt good from the start and seeing my half mile splits ticking by on target gave me a confidence boost to keep on working hard, and I was delighted to finish having taken 45 seconds off my previous PB on the same course. Sally had finished about 10 minutes ahead of me to come home 3rd in her category, brilliant result. It does appear the course was long today, the switchback was further up the road than in previous years which can be clearly seen on Strava, and the Twittersphere reckons around 200 meters too long! As I write there are no official pronouncements from the organizers yet. Update: confirmation has now been given that the course was too long. Paul Stephens ... A week before this year's Stride the weather was looking grim - wet and windy. But as they say the sun shines on the righteous and the sun was certainly shining on Saturday the 4th February 2017. As usual there was a good buzz in the school before the event and plenty of Harriers there for the first trail race in the 2017 league. A steady start and I saw a few Harriers on the first leg to the bucket drop before the climb through the edge of Baildon. After that I passed nobody from the club, and nobody passed me. Not sure that means anything. The support from Harriers around the course was much appreciated and kept me going, along with the fig rolls at the food stops. Yes, fig rolls. I think I got my pacing about right, was able to run it all apart from the steep climb through the mud up the Chevin. It was of course muddy all the way round and I fell over twice, soft landings both times. Unlike previous years I had done a few longer runs during January, and whilst I wasn't fast, I think that helped me get round comfortably. Dave Robson and I were out running on Tuesday, so clearly neither of us had tried hard enough. Some brilliant runs from Harriers, both in front of me and behind me. I was pleased with 4.02 which was 6 second slower than my 2015 time; less pleased with my position at 105, albeit this was exactly the same as 2 years ago. At the moment I'm thinking I'll try some more longer runs this year - perhaps Heptonstall in March?